WASHINGTON (FinalCall.com) - President Barack Obama and Secretary of State John Kerry twisted U.S. foreign policy into an odd shaped pretzel of contradictions March 17, telling the Palestinian President that he would have to make “very hard” decisions including accepting the annexation of vast amounts of Palestinian land taken by military conquest by Israel in order to reach a peace deal with the Zionist entity, while telling the Russian president and the rest of the world community that Russia’s annexation of Crimea is a violation of international law. “The most pressing challenge that Ukraine faces at the moment, however, is the threat to its territorial integrity and its sovereignty,” President Obama told Ukraine Prime Minister Arseniy Yatsenyuk in the Oval Office on March 12 about the six-week-old crisis in that country. But five days later when Palestinian Authority President Mahmoud Abbas was his guest Mr. Obama urged the Arab leader to capitulate. “I have to commend President Abbas. 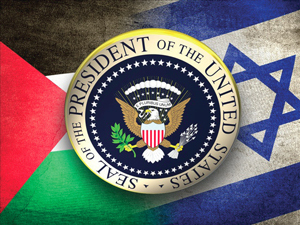 He has been somebody who has consistently renounced violence, has consistently sought a diplomatic and peaceful solution that allows for two states, side by side, in peace and security; a state that allows for the dignity and sovereignty of the Palestinian people and a state that allows for Israelis to feel secure and at peace with their neighbors,” President Obama said about that conflict which has been simmering for more than 64 years. Just two weeks earlier however, an unprecedented, but fledgling effort had convened in Washington by a cadre of former U.S. political, diplomatic and military leaders to try to tamp down the affect of 60 years of growing U.S. financial, military and diplomatic support for Israel. Despite the confab of dozens of scholars and hundreds of participants, this country continues to exert enormous pressure on the Palestinians to concede to Israeli terms to win a peace settlement. The non-partisan “National Summit to Reassess the U.S.-Israel ‘Special Relationship!’ ” packed the ballroom at the National Press Club March 8 to hear from six panels with a total of 25 speakers at an all-day summit of former military and diplomatic leaders, intelligence officers, scholars, economists, researchers and a variety of authors to heed the call of the Council for the National Interest, If Americans Knew, The Institute for Research Middle Eastern Policy, and the Washington Report on Middle East Affairs, apparently to no avail. President Abbas has been backed into a corner where he must accept a bad deal for his people, conceding land, forfeiting the right of his people displaced by the Israeli forced expulsion in 1948, and conceding that Israel is a “Jewish state,” which jeopardizes the rights of all Arab Muslims and Christians who are now citizens of Israel, according to Dr. Gerald Horne, professor of history and African American studies at the University of Houston. The concessions are happening because of the growing influence of the Israel lobby and the political shift in this country toward a right-wing, neo-conservative foreign policy view, he added. “This is causing the White House to put more pressure on Mr. Abbas and it’s not clear to me if he will be able to stand up to the pressure,” Dr. Horne told The Final Call. “Let’s face it. 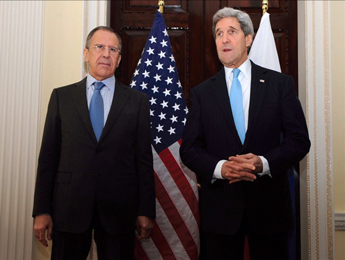 United States foreign policy is racked with incoherence and hypocrisy. “It’s very interesting, that as you go around the world you see a double standard. The United States supported East Timor becoming independent over the claims of Indonesia; supported South Sudan becoming independent over the claims of the Khartoum-based government in Sudan; and yet when it comes to Scotland seceding from the U.K., the United States is opposed; when it comes to Quebec seceding from Canada the United States is opposed; it reminds me of the apartheid era. 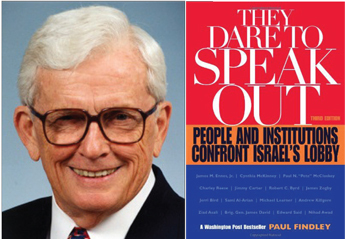 The day-long conference to reassess Israel’s “special relationship” began with 92-year-old former Republican Congress member Paul Findley, the first speaker whose honesty on the subject of Palestine cost him the seat he held representing the 20th District of Illinois in Congress for 22 years. Mr. Findley was not apologetic about his role; he only regretted not having done more for the cause. He complained he should have made it “the cause of the day” before he was defeated in 1982. Mr. Findley called for President Obama to issue an executive order suspending aid to Israel until it recognized Palestinian sovereignty over the territories occupied in the 1967 war. 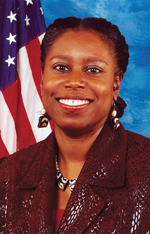 Former Democratic Rep. Cynthia McKinney of Georgia delivered a pre-recorded message, recounting the pressure she and fellow Congressional Black Caucus member Rep. Earl Hilliard of Alabama faced as members of the House Committee on Foreign Affairs, which led to their election defeats. 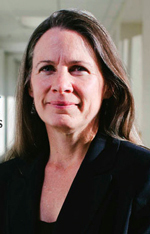 Ms. McKinney had advocated enforcement of U.S. law against weapons sales to human rights violators such as Israel. Retired Air Force Col. Karen Kwiatowski recounted her experience in the Near East and South Asia office in the Pentagon. “If you have anything good to say about the Palestinians,” she recalled being told when she first went to work in the office, “don’t say it around here.” Her commanding officer told his staff to rely solely on data from the OSP and ignore other sources within the government. The Office for Special Plans (OSP), part of the center of Iraq War planning in the Department of Defense was headed by neoconservative appointee Douglas Feith, and it tailored its intelligence to support the war against Iraq. Visiting Israeli officials had easy access to OSP officials, she said. U.S. policy makers are not pro-Israel in the “fundamental” sense, but rather in the “pro-Likkud sense,” that is supporting Israel’s hawkish Likkud Party’s anti-Palestinian, anti-Arab, and anti-Islamic policies on every issue Col. Kwiatowski told the summit. Speaker after speaker recounted similar reports. Pro-Israel political action committees (PACs) disguise their identities using innocent, patriotic, pro-American-sounding names, they said. They bundle contributions from individuals, and generally follow instructions on which candidates to donate to from AIPAC, the American Israel Public Affairs Committee, added critics of U.S. policy. 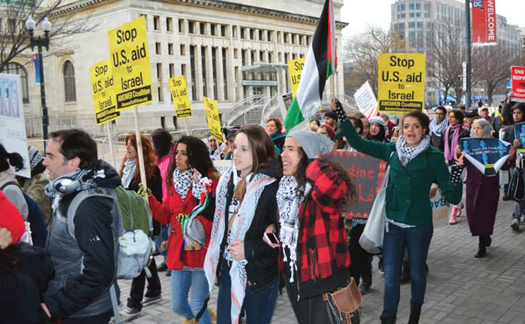 AIPAC is the main congressional Israel lobby, but is not a PAC and does not donate according to “Dissident Voice: a radical newsletter in the struggle for peace and social justice.” Such advice is illegal and has been investigated but never prosecuted. Pro-Israel PACs should have ranked sixth in donations to Congress in the 2012 election cycle, as compiled by the Center for Responsive Politics, but were not even in the top 10, according to Dissident Voice. 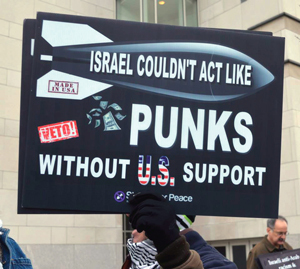 Critics of AIPAC say the group has too much infl uence on U.S. Middle East Policy. The Israel lobby is accused of exercising too much influence on U.S. decisions to wage war in the Middle East. Practically all of Israel’s most intractable Arab enemies have been laid low—Libya, Iraq, and Egypt—and the remaining foes—Syria and Iran—are in the U.S. cross-hairs for military action, pending the failure of delicate diplomacy. The Israel lobby has not only captured both major U.S. political parties, conferees were told, but its behavior may in fact violate U.S. laws. High on the list of Israeli conduct which probably transcended the rule of U.S. law is the attack on the U.S.S. Liberty, they added. Ernest A. Gallo, a retired U.S. Navy and CIA communications technician, is president of the Liberty Veterans Association. He was on board the electronic intelligence ship USS Liberty when it was repeatedly attacked and nearly sunk by Israeli aircraft and torpedo boats in the eastern Mediterranean during the June, 1967 Arab-Israeli war. A total of 34 American crewmen were killed and 174 were wounded, yet the Israeli action was officially covered-up, according to Dissident Voice. The cover-up included a superficial Navy investigation; orders to the crewmen’s families to keep silent; the awarding of the Congressional Medal of Honor to the ship’s captain, and the failure of Congress to investigate, as it normally does any peacetime attack on a U.S. naval ship, Dissident Voice reported. An unofficial investigation in 2003 by retired senior officers and diplomats found Israel knew the U.S.S. Liberty was an American ship, labeled the attack an act of war against the United States and said that it was covered up for fear of embarrassing Israel and confronting the Israel lobby. “It’s very scary when you hear how all these dimensions of how the neo-cons got themselves in such critical positions within our government and our military to be able to push their very, very narrow agenda,” Medea Benjamin, co-founder of Code Pink Women for Peace told The Final Call outside one of the conference sessions, “which in the end has been so disastrous for the Middle East, disastrous for Israel I would say, and certainly for the U.S. and our reputation around the world, to say nothing of the financial crisis that in large part is contributed to by all these wars that we’ve been in. “So I think it’s very important that we hear the kind of connections that we’re hearing today, but that we have followed this road and allowing a small cabal of people to dictate our policies, through the manipulation mostly of money into our political system is a very dangerous thing for what we call ourselves a democracy,” Ms. Benjamin continued. But the tide may be beginning to turn, she predicted. Many view American foreign policy as lopsided. 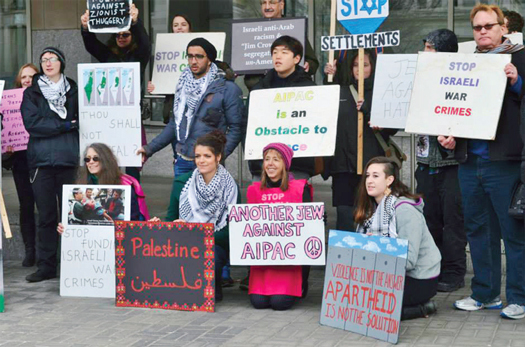 “Certainly we see that in recent years, AIPAC as a main lobby arm for the neo-cons and the pro-Israeli government position have been losing ground. When they once bragged that they could get the name of 80 senators on a napkin on any piece of legislation, they got stuck at 59 this time in their effort to push sanctions on Iran. “Fifty-nine is a hell-of-a-lot of senators, so I don’t think we should be complacent. They are still a very, very, well organized, powerful, well-heeled, and oiled machine, but there are cracks in that machine and I think that we are seeing new groups spring up, whether it’s on the Jewish side, like J-Street or Jewish Voice for Peace, or it’s just a more generic war-weariness that people don’t want to go to war with Iran and don’t want to listen to the arguments of the neo-cons, or that there are people in Congress who understand the mood in this country now, and when there was the uprising against U.S. military intervention in Syria, Congress actually listened to their constituents. “So the times, they are a-changing, and I think in a more balanced way in U.S. policy toward Israel, but it’s going to take a long time to get there,” Ms. Benjamin said. “Such re-consideration is long overdue,” said Dr. Horne. “In light of the crisis in the Ukraine, Russia has already signaled that with regard to putting pressure on Iran concerning its nuclear facilities that that’s less likely, with the U.S. pressure on Russia itself. This increases the possibility that Israel will take unilateral action to bomb Iranian nuclear facilities and therefore drag the United States into yet another war with a nation predominantly comprised of Muslims,” Dr. Horne continued.